We provide Printing Machine that are highly durable and efficient. This machine is ideal for printers who wish to enter into printing work but has a low budget as it offers best value for money. We provide Rotary Label Printing Machine that are highly durable and efficient. These machines are extensively used to cure or emboss printed or dyed fabric, paper, leather and metal. Our Infra - Red Drying Machine works on hot and cold air circulation drying process that reduces energy costs. These machines are compact, easy to install and use and are widely employed in web, sheet, textile and other industries. Further, our machine can be installed in combination with a rotary belt. We provide a range of high speed Garment Label Printing Machines that is at par with international quality standards. Versatile label printing press boots of these machines boosts productivity and are cost effective. Comparatively small size of these machines allows them to be placed conveniently in small spaces. 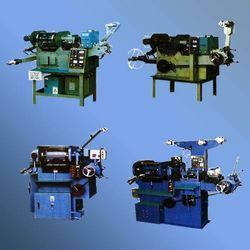 These machines electrically driven and offers smooth and fast operation. Our Garment Label Printing Machines are easy to operate and have a longer service life.